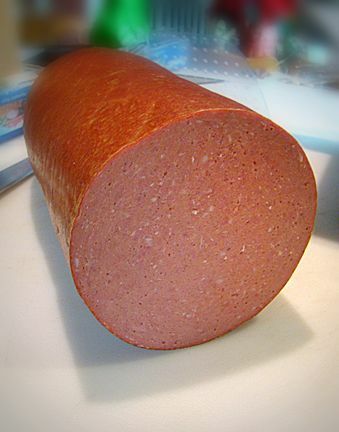 Great looking bologna. IN your picture you say to mix and put in frig overnight but in your directions you say to mix salt,cure and water and put in frig for a hour or so? Not sure if meat,cure and salt just go in frig for 1 hour and when casings are completely stuffed then it goes overnight? Also what wood did you use for smoking? Thanks. My original plan was to complete the job in one day?let the mix with cure sit for the 'prescribed hour' per the recipe & stuff the chub, but I had other unexpected commitments & thus, had to refrigerate the mix with cure overnight. No harm, no foul. The point being was to allow for 'some' cure time. Whether its before the mix gets stuffed, or after its in the casing, I dont think it really matters. Some feel its easier to stuff & handle the cured & salted mix you don't let it sit too long. I suppose if time allowed, I would've mix ALL the ingredients, stuffed & let them rest overnight again to marry the flavors. I used maple wood for the smoke. Is it possible to freeze bologna? If so how long would it keep in a vac bag? This makes me want to eat Bologna. Never thought I would say that. How well did the stuffer handle the stiff meat? I imagine after the sausage sat in the refrigerator over night it was very cold and stiff. After the overnight 'rest' I gave the salted & cured meat, it was a challenge feeding it though the grinder a second time for a FINE grind. I added splashes of ice water as I fed the meat paste into the throat of the grinder. This helped to keep the sticky stuff moving along. Still a pain, but less of a pain than the whole processor/emulsifying ordeal I've done in the past. No issues at all using the stuffer. I hadn't used the cannon in quite some time (been doing smaller batches), but it worked flawlessly for this 10-pound batch. Working with large casings is quite a bit easier than small diameter natural casing which will tend to blow out if I dont keep a sharp eye on the flow-speed. After the second grind, the meat wasnt stiff at all, just a nice smooth, semi-sticky paste. I'm really pleased with the texture of the final product. It's very similar to the 'old-fashioned' butcher shop boloney I was shooting for. Long-term storage just isnt necessary this time as the 10-pounds of bologna will be gone in just over a week! 3. The balance I put in FoodSaver bags in the freezer (long-term storage). This would keep for at least 6-8 months, easily. However, since the boys of mine are just plowing through the stuff at a ridiculous rate, I have to keep pulling the freezer bags out to thaw just to keep a supply on hand. In hindsight, I probably could've skipped the FoodSaver step & save a few $. I vac seal and freeze bologna all the time. If i know its going to freeze for some time i mix in some Trehalose. My post is entirely my opinion and thoughts. Why you want it sweeter? You would think it would be but its not. Well why add a sweetener then? Seems i'm missing something. Elimate "freezer flavor, Trehalose is a natural sweetner and anti-oxidant that is half as sweet as sugar. It will take the "wild" out of game, "fishy" out of fish and "fowl" out of turkey sausage. I was wondering what you use to poach your bologna and where can I order one? Thank you for the great information. I am trying my first batch today! Very educational!